Shahid Kapoor finds himself in the thick of a romantic-period-of -sorts as his next two releases are high on the romance factor. Shahid's home production MAUSAM, which according to the actor is an intense love saga is set to release on the 16th of September this year. If that was not enough romance in Shahid's life, the actor has almost completed 30% of another romantic project with Kunal Kohli with his ex-flame Priyanka Chopra playing the female lead opposite him. Tired of playing the romantic, Shahid now wants to put an end to it. The actor is eager to don the action avatar in the coming time and is waiting for such scripts to come his way. In the last year and a half Shahid has been busy with MAUSAM and now his film with Kunal Kohli is set to keep him engaged for the next few months after which it will perhaps be the end of romance for him. A Judai song brought Sonam and Shahid Kapoor closer! A Judai song brought Sonam and Shahid closer! Mumbai: It’s a well known fact that the goings between Sonam Kapoor and Shahid Kapoor are like chalk and cheese, until recently at the sets of ‘Mausam’ when the two finally opened up. An emotional number in the film just worked perfect to break the ice between the two. Though Shahid Kapoor and Sonam Kapoor have been working together in a film and the shooting has been going on for a while the two have kept distance from each other off camera. A source said to a daily, "Shahid and Sonam are different kinds of actors. Shahid likes to rehearse and get his dialogue and expressions right before the final take. Sonam is more spontaneous, and impulsive in front of the camera. When Raakhee Gulzar worked with Amitabh Bachchan, she faced the same problem. He got better with every take, while she lost her concentration and became laboured with every extra take." Similarly every retake the actor got left Kapoor agitated. But their differences melted when they shot a separation song. "The location crackled with their chemistry," added the source. "We don`t know what it was. But something definitely happened to finally break the ice between Shahid and Sonam. While earlier there was a wall of reserve between the two, the judaai song made it okay." When the two faced the camera, it was like they knew exactly how to complement each other on screen. Sonam was dressed in a simple salwar kameez and Shahid wore an Indian Air Force uniform. And they looked like they couldn`t keep away from each another for a second. Director Pankaj Kapoor was finally able to heave a sigh of relief," the source added to the daily. Shahid doesn`t deny the chemistry that the crew witnessed. "It just happened, I guess. After shooting together for so many months, we were bound to come around. The song has turned out to be very special. We both got swept into the emotional vortex of the words and tune," said the actor to a tabloid. Shahid's open invitation to fans! If you thought the ongoing roadtrip of Zindagi Na Milegi Dobara cast is an unconventional tool of promotion, read further. Shahid Kapoor will launch the promo of his forthcoming film Mausam not just for the media as happens always but also for his fans! We have gathered information on how Shahid and Sonam Kapoor have actually invited their fans to come and attend the promo launch of Mausam on Monday evening at a suburban Mumbai multiplex! Shahid Kapoor's publicist confirmed the news. "Shahid has a huge & loyal fan following. They love him and were hellbent on seeing the promo of Mausam for a long time. They kept posting on the micro-blogging account of Shahid their ardent desire to see the promo at the earliest. The idea of inviting the fans for a promo screening originated from here. 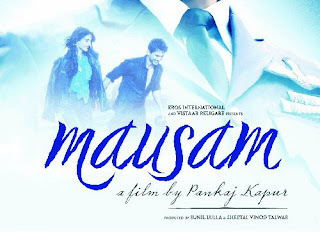 Mausam's team sat together and thought if this could be worked out. Shahid loved the idea of interacting with his fans in person and letting them be a part of his promo-launch too. He gave a go-ahead and the plan of having the fans over for the screening of the promo post the press conference was finalized. Sonam's fans too showed great interest post the news got circulated on web as Mausam even trended on Twitter (in Mumbai & India) yesterday" stated the publicist. Speaking about the number of fans expected, the publicist added, "It will all depend on how many of his online fans are actually based in Mumbai. Heavy rains in the city could be another hindrance but we are expecting a fairly large crowd for whom arrangements are being made. An entire screen will be booked for the fans and depending on the numbers we can split the screenings in rounds. A press conference will be held at the same venue after which the stars will head to meet their fans at the screening." Now Shahid fulfilling his fans' wishes by actually meeting them and sharing his special day with them is really cute. Hope other actors follow suit and converse with their fans in person other than merely doing it in the virtual world.